Written by four recognized experts with senior experience in research and government, this text is the first comprehensive survival kit for students and practitioners of economic policy. It is set to become an indispensable resource for everyone involved or interested in modern economic policy. Academic scholars willing to engage in policy discussions and students at graduate or advanced undergraduate levels will find it an essential bridge to the policy world. What makes the book unique is that it combines like no other, facts-based analysis, state-of-the art theories and models, and insights from first-hand policy experience at national and international levels. The book has grown out of ten years of experience teaching economic policy at the graduate level. 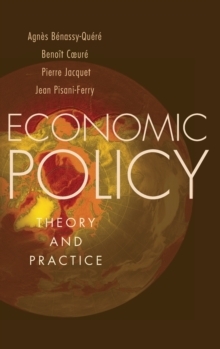 It provides an intellectually coherent framework to understand the potentialities and limits of economic policy. 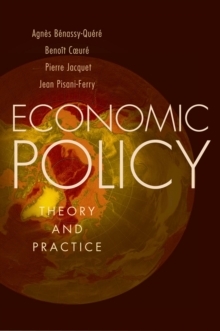 It addresses positive dimensions (how do policies impact on modern economies? ),normative dimensions (what should policymakers aim to achieve and against what should their action be judged?) and political-economy constraints (which are the limits and obstacles to public intervention?). It fills an important gap by reconciling in each major policy area stylized facts of recenteconomic history, key questions faced by contemporary policymakers, and essential lessons from theory which are captured and explained in a clear, concise, and self-contained way. All major areas of domestic and international policymaking are covered: fiscal policy, monetary policy, international finance and exchange-rate policy, tax policy, and long-term growth policies. The book concludes with a special chapter on the lessons of the financial crisis. The authors are intellectually non-partisan and they draw examples from various countries and experiences; from emerging markets to developing economies, shedding light when necessary on local specificities such as European Union rules and instruments. Economic Policy: Theory and Practice is the essential guide to economic policy in the new post-crisis context. Pages: 728 pages, 158 line illus.